A very Bengali way of making mach'er jhaal with potatoes, eggplant and spicy urid wadis.This mach'er jhaal is one of our fav way of making fish curry specially with pona mach or rui fish. Salt as per taste in Gravy and for marinating the fish. 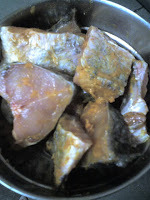 Wash fish pieces thoroughly in water , marinate in turmeric powder and salt, keep aside for atleast half an hour.Discard the water that comes out marinating the fish after few times. 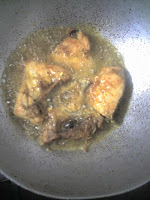 Heat a kadai/Saucepan better a Wok , add oil , fry fish pieces at med low , till brown on both side it will take approx 4 mints on each side .Fry all the pieces.Take out and keep aside ..
Fry the Badi (It requires a bit more oil , add more oil approx 2-3 tbs for better results)slowly at low till golden brown , take out and keep aside on another Bowl. Now add nigella /Kalaunji/Kalo jeera seeds to the above oil for the Phoron/Tadka sauté them , add potatoes , Brinjal/eggplant pieces and add salt fry at low for atleast 5-7 mints stiring in between for even frying. Cover and cook for atleast 10- 15 mints at med-low or till the potatoes are soft.The brinjals will cook before potatoes , If you feel , you can add them at the time of mixing in water . Add finely chopped fresh cilantro/Corriander leaves. 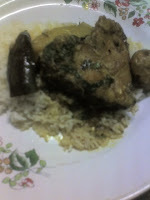 This is a wonderful recipe to cook Rui Maach or Pona mach. We served it with warm cooked rice . I have always ignored Pooja's event , but not this time ,She has come up with the wonderful theme for V-Day , more info here Theme of the week V-day This one goes straight to you dear Pooja. 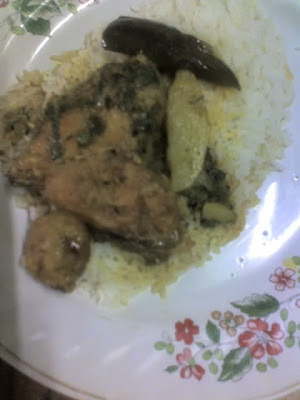 some more recipes next time , Happy cooking and Bon Appetite. Dish ooks delicious!! Thanks for info.I am a Shaiva,felt great reading it.I have never been to Varanasi,got to make a trip.Thanks Jaya. nice entry for the theme,though is a non-vegeterian its perfectly ok, as the theme is to cook something your hubby loves. :) . I am glad to receive your entry for the first time, also its nice to know more about allahabad. will just kidding ! :D . thanks for participating and sharing this with all of us. ya ,I know i have too missed all of you ...I wont be able to blog regularly but whenever i will find time i will do it definitely...thanks for coming buddy..
Varanasi ,you got to be here ,If you are shaiva,we also worship Lord shiva ...Allahabad, varanasi,Ayodha,haridwar,Vrindavan ,Mathura ...these are very much religious cities. Do visit whenever you come here in India. Hugs and smilesto all of you wonderful ladies. aami beta te move korechi,jaanina keno tumaar comment ta payi ni ,anyways I am delighted you also like it.. I have read the recipe twice but do not see where you add the fried fish into the whole concoction; are you sure you have not missed a step? BTW, is this supposed to be a jhaal or a jhol? 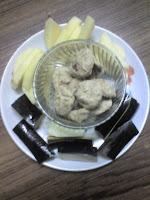 I am Glad yoy took time to read this post, add fish pieces when adding water to the fried vegetables and Bodi. Whatever suits you , you can call this..
as far as I know, JhaL is a thick Gravy like and little more spicy, mine turn out exactly like this, so Jhal.and If add more water to the gravy it will turn out like Patla Jhol.Do let me know if you have further querries ..